G.I. Joe Retaliation Delayed Because of Channing Tatum? When the release date of G.I. Retaliation was delayed nine months for 3D conversion, after millions of dollars had already been spent promoting it, it sounded like a Cobra plot. Surely Paramount knew that 3D was a big moneymaker already, and had plenty of time to make that fateful decision before the last flipping minute. Well, the problem may have turned out to be something the bigwigs couldn't predict: Channing Tatum's sudden surge in popularity. POTENTIALLY MAJOR SPOILERS AHEAD, FOLKS. Well, you can probably predict the problem from the trailer, which says no uncertain terms that most of the G.I. Joe team gets killed by Cobra at the beginning of the film, and then suspiciously avoids showing Channing Tatum at all afterwards. Director Jon M. Chu appears to have made a calculated effort to distance his sequel as much as possible from Sommers' critically-reviled blockbuster, and part of that plan appears to have been to kill off the previous film's protagonist early on, to make way for a new, unsullied cast. In other words, they specifically planned to keep Channing Tatum out of the film as much as possible, and that plan has horribly backfired. 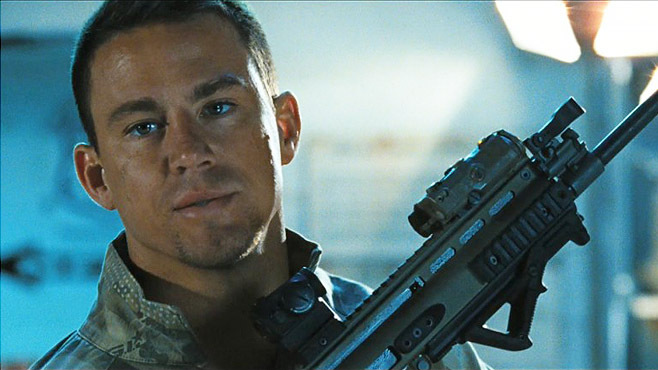 Now it appears that the delay is also intended to allow for reshoots that would increase Tatum's role in G.I. Joe: Retaliation, although how far they plan to take them is unknown. They could beef up his role at the beginning, or even try to sneak him into more of the actual plot somehow. Time will tell. This sort of thing isn't new, of course. When Matthew McConaughey broke out in 1996's A Time to Kill, his tiny role in the "Bill Murray Gets an Elephant" comedy Larger Than Life was reshot to make him a presence throughout the entire movie. On the other hand, you also have to take into account what audiences were expecting going into the screening. Reportedly the David Fincher serial killer classic Se7en scored very low with test audiences, who were informed only that they were seeing a film with the stars of Driving Miss Daisy and Legends of the Fall, only to discover that the Se7en had nothing in common with either of those films except the actors. Of course they were disappointed. We hope that Paramount checked to see if audiences were recruited to see "a film starring Channing Tatum" before they took these criticisms to heart, because drastically reworking a film to undo a specifically, clearly carefully-chosen plot point sounds like playing with fire in an ammunition factory. CraveOnline will be back with more G.I. Joe: Retaliation news after we reshoot Scream to include more Drew Barrymore.